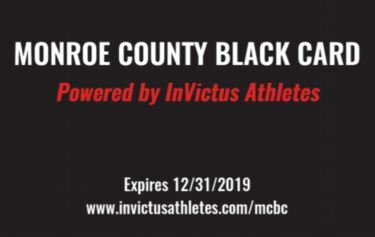 MCBC is a membership program where members get EXCLUSIVE DISCOUNTS at their favorite businesses located in Monroe County. Anyone can become a member and ANY business can participate. IMPORTANT: MCBC Members must present their Card & The Monthly Coded Text Message to receive discounts at MCBC Businesses. MCBC takes 30% of net profits every year and donates that money to Monroe County based charities that partner with MCBC. Copyright © 2016 InVictus Athletes . All rights reserved.